Looting has started in Houston, as the city deals with massive flooding and damage from Hurricane Harvey. A video uploaded to Facebook shows looters carrying televisions and other items out of a store. The chief of the Houston Police Department Art Acevedo said that some looters have been arrested, but it is not clear if the suspects arrested are the same ones that appear in the video. Houston is facing worsening historic flooding in the coming days as Tropical Storm Harvey dumps more rain on the city, swelling rivers to record levels and forcing federal engineers on Monday, Aug. 28, to release water from area reservoirs in hopes of controlling the rushing currents. Harvey was the most powerful hurricane to strike Texas in more than 50 years when it came ashore on Friday near Corpus Christi, about 220 miles south of Houston. It is responsible for at least two deaths. 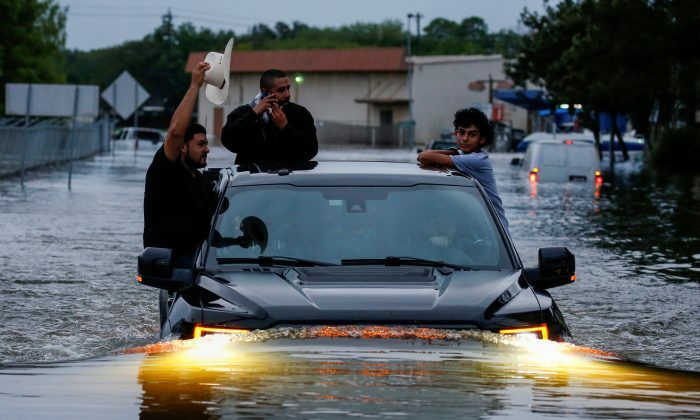 It has since lingered around Texas’s Gulf Coast, where it is forecast to remain for several more days, drenching parts of the region with a year’s worth of rain in the span of a week. Rains have submerged cars and turned freeways into rivers, with more flooding expected when the storm shifts back in the direction of Houston. Harvey’s center was 90 miles southwest of Houston on Monday morning and forecast to arc slowly toward the city through Wednesday, with the worst floods expected later that day and on Thursday. Schools, airports, and office buildings in the nation’s fourth largest city were shut on Monday as chest-high water filled some neighborhoods in the low-lying city that is home to about 2.3 million people. The metropolitan area, home to 6.8 million people, also is the nation’s refining and petrochemical hub, which has been crippled by the storm. Numerous refiners shut operations, likely for weeks. Torrential rain also hit areas more than 150 miles away, swelling rivers upstream and causing a surge that was heading toward the Houston area, where numerous rivers and streams have already been breached. Some areas have already seen as much as 30 inches of rain, according to the National Weather Service. By the end of the week in some Texas coastal areas the total precipitation could reach 50 inches, which is the average rainfall for an entire year, forecasters said. Harvey is expected to produce an additional 15 to 25 inches of rain through Friday on the upper Texas coast and into southwestern Louisiana, the National Hurricane Center said.